Cucina Migrante’s Cultural and Culinary Journeys are a once in a lifetime authentic experience. …..because not all tours are created equal! …. Everyone deserves one of those trips that takes your breath away and fills you with so much positive energy, creativity, gratitude and love that will sustain you for the whole year even if that is the only fun adventure you undertake! Our Cucina Migrante’s Journey to Italy was born from this experience and our desire to spread it to more wanderlust lovers for whom just a typical vacation is not that...hmmmm...satisfying! I visited south of Italy and Sicily for the first time last year and was lucky enough to have the best guide in the whole country! Everything from my accommodations to my food, places to visit and eat, places to party and hear great music, museums, churches, authentic restaurants, natural hot springs, exquisite spas and bathhouses, architectural monuments and world heritage sites, deserted towns and villages, natural wonders and volcanos, horseback riding, visiting private orange plantations, island hopping, opera visits...you name it!...was taken care of! I spent 5 weeks in paradise, worry free, not only because of where I was (everyone is aware of Italy’s beauty, fine cuisine and rich cultural history) but because of who I was with! Visiting a country with a knowledgeable local who devotes their time to you and making the best experience for you, is what made my trip extraordinary! Our guides’ love and knowledge of regional food and wine, architecture, art and history made it so much more than a typical tourist experience and it was a real treat to experience a country and culture in such an authentic way! It was a very balanced trip that was plenty of entertaining, relaxing and educational, all catered to my interests. Cucina Migrantes’ culinary and cultural journeys are mouthwatering delicious, full of education, fun, and custom catered adventures to fill your heart desires. 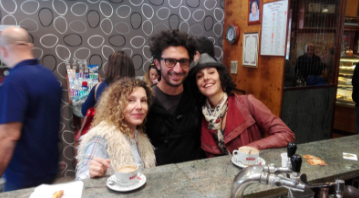 Here are my top 5 reasons why traveling with Cucina Migrante is so AWESOME! Hassle free, educational and FUN every step of the way! Knowledgeable local guides that will show you all kinds of secret amazing places, cater tours to your interests and make sure you EAT well all the time! Not your typical travel tour! Experience the country like a local! Custom tours with positive, interesting and like-minded people. Do your own thing! You still have plenty of time to yourself and to do your own thing. Enjoy some photos from my journey to south of Italy and Sicily and Contact Us to book your trip of a lifetime!